Doc's Toy Hospital bag from the show! Dottie 'Doc' McStuffins, a six year old girl, 'fixes' toys, with a little help from her stuffed animal friends, Stuffy, Hallie, Lambie and Chilly. In 2016, Doc will be transported to McStuffinsville to become the Chief Resident of the Toy Hospital, where she and her toy friends will help toys from all over the world! Who's ready for a Toy Hospital checkup? 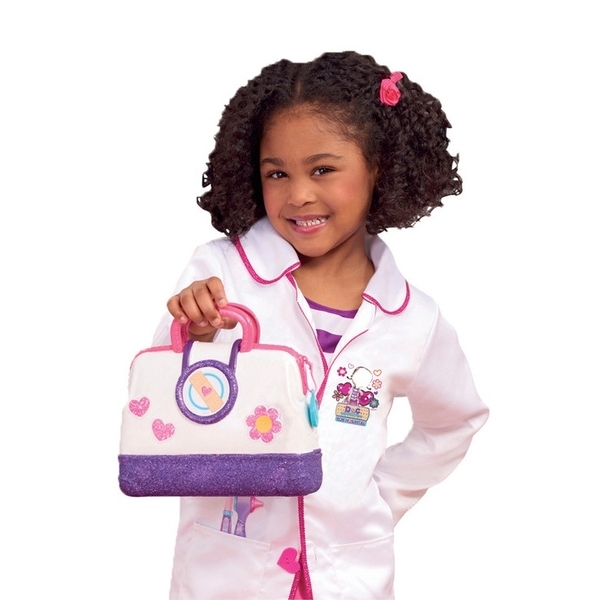 The Doc McStuffins Toy Hospital Bag Playset includes multiple tools and a light up stethoscope. Now your little Doc can practice her skills and nurture her favourite toys back to perfect health.